New system will replace list of unemployment handouts. But senior figures, including Chancellor George Osborne, are concerned about whether the computer software needed for the £2bn project is on schedule. Also, although Osborne supports the scheme in principle he is worried about such a high profile scheme affecting so many people in the run-up to the next election. It doesn't make sense to pay people not to work, in the government's opinion. When the millions of self-employed who have helped keep the unemployment figures low, yet only survived thanks to tax credits, discover the horror that awaits them in Universal Credit, then the Tories can kiss goodbye to any wet dreams they're having of winning a majority in 2015. You might want to do a piece on self-employment and universal benefit (if not already done) which as far as I can tell has been missed by just about everyone else. Would you give petrol and matches to a pyromaniac? IDS is proposing a similar thing. If the system works as intended, Universal credit will possibly help simplify the benefit system and make life easier for the majority of new claimants, but thrusting housing benefit style direct payments for rent onto a minority of people unable to manage their own affairs effectively will not be one of them. For example, would you suddenly start handing out lump sums of extra cash to gamblers when they will be faced with the temptation to succumb to their addicition or paying their rent? What happens if they fritter it away and end up on the streets? Is it their fault, because they have a problem, or is it the systems fault for failing to take circumstances into consideration and providing inadequate support to help people recover? 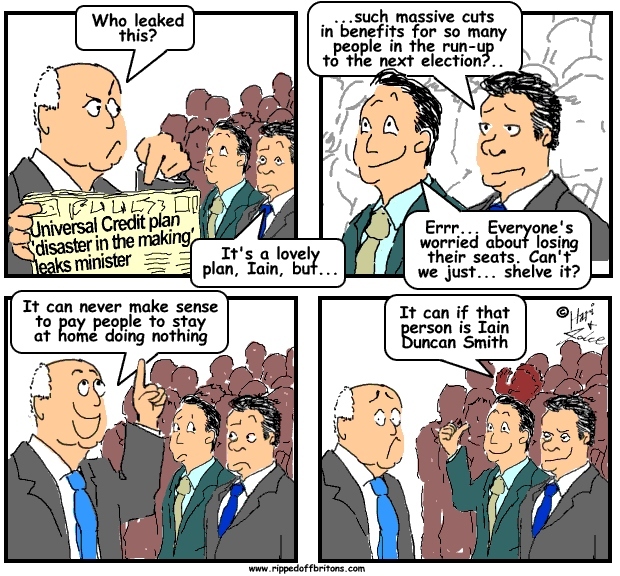 To his credit IDS is at least taking some form of action on welfare reform even if he is cutting way too deep, but there will be a real human cost to IDS welfare reforms. Fortunately for him, he won't be paying the price it. This might be an unpalatable truth for some liberals but paying some people - compulsive gamblers, alcoholics and drug addicts for examples - their rent directly is an extremely bad idea because of the nature of their problems. Also some vulnerable people will have more money in their hands that can be taken by those who exploit them. These problems will cascade into the housing sector and wider society.